This month, God gave me another new song. It's been years since the last one, but this one is special to me because I specifically asked for it. You see... last year, as new Christmas songs came out on the radio and old ones were resung and redone, I found myself wanting a new kind of Christmas song. I wanted one that didn't focus on the baby in the manger or what that Baby had come to do. I didn't want it to focus on angels or shepherds either. Rather, I wanted to sing one that told the story of what the One in the manger had already done before that Christmas morning. 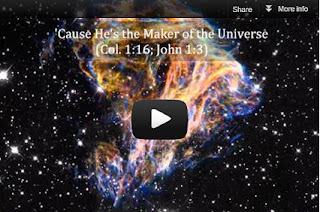 He is the image of the invisible God, the firstborn of all creation. For by Him all things were created, both in the heavens and on earth, visible and invisible, whether thrones or dominions or rulers or authorities—all things have been created through Him and for Him. He is before all things, and in Him all things hold together. That's a LOT of power. Seriously. One thing that I've gotten more revelation on this year has been that Jesus's power is the stuff of legends... the stuff that superheroes want and story writers try to give their heroes. Read that verse again. It says that He literally is the power that is holding the earth in its orbit and the Milky Way galaxy together. He's the One with the power that made your heart beat its first beat when you were inside the womb. He's got power and authority over every king, prince, president, parliament, general, genius, CEO, and emperor that ever existed. So if you take every power that every hero in every story ever written has ever had and pull it all together in one person, you still wouldn't come close. Jesus is the hero of the story that the Author of Life has penned. When authors write stories, they write the whole thing for the hero. They set up the forces of darkness and make them powerful, just to show how much the hero can overcome and prove that the hero is worthy of the name. As an author, if your hero looks weak, you just up the stakes against him, and then give him the skills to beat the villain anyway. In a well-written story, everything that happens points, in some way or another, to the hero. And isn't that what that verse specifically says that God did? "All things are created for Him." History is literally His story. ...Christ Jesus, ...although He existed in the form of God, did not regard equality with God a thing to be grasped, but emptied Himself, taking the form of a bond-servant, and being made in the likeness of men. And that is the truth that I wanted to sing about last year, for it awes me. The thing is, though... I can't write songs. Literally. I can write these blogs (though I try to let the Holy Spirit write them). My day job is editing, so I can easily write smooth, grammatically correct paragraphs. I can polish a mediocre plot into relatively good prose. But I can't even write even a slightly-mediocre song. And so I asked God to give me another, like He gave me the other songs years ago. But days and weeks went by, Christmas passed, and I heard no new song in my spirit. This Christmas season, my worship leader asked if I wanted to sing a Christmas special. I told her I did, but I didn't know which one. In my spirit, I told God, "Lord, I know what I want to sing, but You haven't given me the song yet. Will You?" Well... He started to give it to me that week. Just a few lines here and a few lines there. Over the span of three weeks, I kept listening and waiting, as I slowly heard line after line and they began to come together, along with the scriptures they were coming from. And so today, as Christmas approaches, I am sharing the words and scriptures it references. I have no recording to share the melody, but I pray that God will whisper a melody to your spirit and that the Holy Spirit will reveal the truth of these words to you so that as Christmas dawns, you will enjoy a deeper revelation of just who the One in the manger was, what He surrendered just to be there, and why He did it all. For those of you who asked...here's a recording of it. Please forgive my shaking voice and fumbling fingers as both missed notes and chords. I pray that the words of the song minister to your heart. Beautiful! Wish I could hear it! Wow. The lyrics brought tears to my eyes, Katie. Especially the title line. I love the integration of scripture and story terms. Any way you could get a recording up? One day I want to record all three, Michelle, but I need my worship team to be there playing with me... and so far, the prospect of getting all of us to a recording studio with our drums and guitars and keyboard with enough time (and money) to keep at it until it's done right is rather daunting. I'm going to ask them to record it Sunday, but our recordings don't come out well, since the sound levels are set for the building, which is evidently completely different than what you need when it's all going into a computer. I agree with Annie, except I can look forward to hearing it!